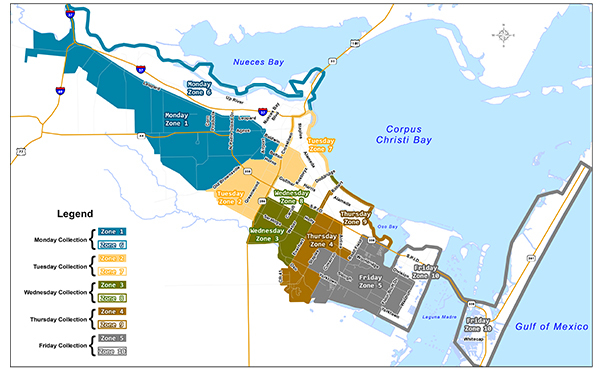 The City of Corpus Christi offers curbside service for garbage, recycling, heavy brush and bulky item pick-up. The City provides several ways you can keep track of your Garbage and Recycling pick-up schedule. Garbage is picked up once a week and Recycling is picked up every other week unless there is a change due to a City Holiday. Heavy Brush & Bulky Items are picked up several times a year on a published schedule. The service area is divided into ten "areas" or "zones." Each area has its own unique pick-up schedule. The Green Cart is for Garbage and Yard Waste and the Blue Cart is for Recycling. Find your zone on the map above and then use the zone links listed below the map to access your area's calendar and map. You can view a larger version of the map above, here.